It has a serial & parallel link which enable user to communicate with PC. User can develop the circuit/schematic using Xilinx standard Foundation Series Software and any development tool for VLSI design available in the world. On board microcontroller with 64K flash, 1K RAM ISP with required software. 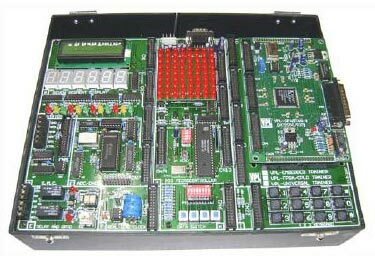 It has I/O counter interface to enable it to connect various demo modules. This helps in man to machine interface.